The Malayan Campaign (1941 – 1942) fought by the British and Indian troops was a chain of disasters. The British, Indian and Gurkha regiments were under trained and under armed. The British has underestimated the Japanese invaders. They faced a superior well-trained Japanese army veterans who had fought in Manchuria in 1931 and the Sino Japanese war (1937 – 1945). The British, Indian and Gurkha regiments had no training in jungle warfare and some Indian regiments had hardly six months of training in the rugged cold and hot North West frontier of India. In spite of such adverse conditions the defenders fought a gallant losing battle of “stand and retreat”. In Kedah, the 11th Indian division was badly mauled in Jitra and Gurun. The division lost men, equipment, food and arms as the Japanese tanks drove through the weak defenses. The 6th and 15th Indian Brigades had to be amalgamated as t he 6/15th Indian brigade because of heavy losses in men and arms. The 1st Leicester Regiment and the 2nd East Survey Regiment merged to form the one and only one British Battalion who won their honor and battle honours at the epic Battle of Kampar (30th of December 1941 to 2nd of January 1942). The 1/8th Punjab Regiment merged with the 2/9th Jat Regiment to form Jat/Punjab Regiment. The men reached Ipoh on the 19th and 20th December 1941, where they were refitted with new weapons and equipment. Two days later the refitted 6/15th Indian Brigade moved to Kampar by train and road. 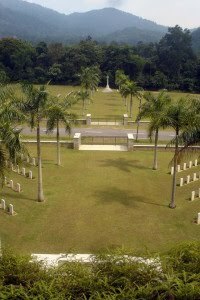 Kampar was chosen by Lt. General Arthur Percival, the G.O.C, Malaya Command to make ten days stand to hold the Japanese advance as the three low ridges just a mile north of Kampar town command the main road approach and also the railway line on the flat tin mining terrain was ideal ground for the British to utilize the superior British artillery. The 28th Indian Brigade guarded the Kuala Dipang-Sahum road to the east of Gunong Bujang Melaka (4070ft). The 12thy Indian Brigade held the Jeram to Kuala Dipang iron bridge section (now a little up-stream of the present new brigade). There was heavy fighting on the 28th and 29th December 1941 for the vital Kuala Dipang iron bridge over Sungai Kampar. The Japanese supported by 14 medium tanks made a frontal attack from Jeram and due to the lack of anti-tank guns ; the 12th Indian Brigade had no alternative but to withdraw. The 28th Indian Brigade withdrew to the Sungai Siput to Sahum road. When the rear of the 12th Indian Brigade crossed the Kuala Dipang iron bridge, it was blown up and due to the heavy rain, only the middle span was destroyed. The British artillery was ranged on the iron bridge and the Japanese were delayed for few hours. The defense of Kampar was left to the 6/15th Indian Brigade and the forward defense was held on the three low ridges north of Kampar. The defenders had only eighty days to dig trenches and artillery positions to face the powerful Japanese assault. Luckily the Japanese tanks were held up by the damaged Kuala Dipang iron bridge and the five bridges further down the road to Kampar. The strong British artillery made up of the powerful 25 pounders and the mortars kept the Japanese from repairing the dynamited bridges. For the first time in the campaign, the British artillery bombardment frustrated the Japanese advance. During the daytime from 30th December 1941 to 2nd January 1942 the Japanese planes bombed and machine-gunned the British positions on the two forward ridges. To the west of Kampar, 1/14th Punjab Regiment, 2/16th Punjab Regiment and 3/16th Punjab Regiment held the railway line from Malim Nawar to Tronoh Mines. This area now known as Bandar Baru was strongly covered by the British artillery of 25 pounders and howitzers (88th Field Regiment RA). To the east of Gunung Bujang Melaka (4070ft) was the 28th Indian Brigade of 2/1st, 2/2nd and 2/9th Gurkha Rifles supported by the strong 155 Field Regiment RA. The main road defense position were covered by the British Battalion and 6/15th Brigade reserve the Jat/Punjab Regiment. From 30th to 31st December 1941the main defenses of the British Battalion were attacked by Japanese infantry and many Japanese died in their unsuccessful bonsai charges on the forward slope of Thompson Ridge. The eastern flank failed because the Japanese underestimated the tough fighting of the Gurkhas and many Japanese died when the gallant men from Nepal used the deadly kukri with success. On the west the Japanese were caught in the heavy saturation bombardment of the 88th and 122nd Field Artillery RA. The Japanese were caught in the swamps and deep mining pools and many died by drowning. Lt. General Matsui the Commanding Officer of the 5th Division from Hiroshima had to press the attack against the main road defenses of the British Battalion who withstood continuous bombing and strafing and mortaring from the Japanese units. On the 1st of January, 1942 the Japanese infantry had reserves and all units were replaced by fresh reinforcement. The British and Indian defenders did not have reserves to replace the wounded and the tired defenders. The Japans pressure was telling on the tired and exhausted defenders of the British Battalion. They held on grimly and on the 2nd of January 1942 , the Japanese launched two strong assaults on the eastern flank of the British Battalion. Some eastern trenches were overrun and the Japanese were occupying the trenches. Two British reserve companies made two counter attacks to reoccupy the lost trenches. The British in spite of causalities retook the trenches and drove out the Japanese. Later in the afternoon the Japanese applied great pressure after heavy Japanese artillery bombardment, the British defenders had to give up as they were short of ammunitions and mounting causalities. The Japanese occupied the trenches . Brigadier Moorhead the Commanding Officer of the 6/15th Indian Brigade ordered the Jat/Punjab Regiment to counter charge to remove the Japanese on the east. The first Jat/Punjab Company suffered badly and had to give up. Later at about 5:00pm. Captain Graham assisted by Lt.Lamb led a company of Sikhs and Muslims to counter charge the Japanese postions. Captain Graham led his company up Greed Ridge and gave his final instructions. All men were given two drams of rum and then he ordered them to fix the 18 inch steel bayonets to the rifles. He led the group down the trench from Green Ridge. Captain Graham told his men that the attack must succeed and the honour of 1/8th Punjab Regiment depended on it. He wished them all the best and the counter charge up the rear of Thompson Ridge started. Captain Graham and Lt. Lamb led their men to their desperate venture. From the very start, the brave attack was greeted by Japanese devastating fire and brave men fell like ninepins. Lt. Lamb was among the first to be killed in the hail of machine gun fire. However the second line inspired by Captain Graham’s example shouted their battle cries. The bearded Sikh warriors yelled the blood curdling cry of “Bole So Nihal, Sat Sri Akal”and the Mussulman shouted “Ya Ali”. The front line Japanese trenches were breached and close hand to hand combat with shining bayonets proved the tall Sikhs superior to the short Japanese. They continued their braved counter – charge like men possessed. Captain Graham was everywhere giving exhortation to his inspired men. The Sikhs and Gujars succeeded in dislodging the second line of Japanese. Undeterred by heavy causalities Captain Graham by now wounded urged his men onwards to clear the third line . His gallant company was by now depleted in strength and weapons . He led his men for the final assault and before he reached the Japanese third line of trenches a Japanese trench mortar bomb fell into the trench and blew off both his legs below the knees. Mortally wounded, Graham Sahib shouted encouragement to his few Sikhs and Gujars, kneeing on his shattered stumps and hurling grenades as the remnants of the 41st Japanese Regiment fled towards the jungle. The third line was held when Graham collapsed and was carried back to Green Ridge first aid post. He was attended by Captain Doctor Roy of the British Battalions and sent by ambulance to the 11th Indian Division hospital at Tanjong Malim. He died from loss of blood a badly damaged kidney and liver. After Graham’s counter-attack Brigadier Moorhead and Lt. Col. Morrison of the British Battalion reported that the Kampar positions could not be held indefinitely as news of new Japanese west flank landings had occurred at Telok Anson and at Bagan Datoh to the South West of Kampar. Indeed the epic four day Battle of Kampar was throughout a tribute to the endurance and valour of the 11th Indian Division after its heartbreaking experience in North Malaya. The Battle of Kampar where the British, Indian and Gurkha troops fought extremely well showed that untrained troops are at least the equal to the Japanese troops. To the struggle which had been going on at Kampar from dawn to dusk on the 2nd of January 1942 it is difficult to do full justice. It is a classic example of what can be achieved by grit and determination and it brought out the finest characteristic of the various troops engaged. There were the enemies repeated attempts to gain possession of Thompson and Green Ridges commanding positions which would have enabled them to enfilade our positions on the lower ground. The attacks were made with all the well known bravery and disregard of danger of the Japanese soldiers. There was the dogged resistance, in spite of heavy losses by men of the British Battalions and their supporting artillery and finally when the enemy had captured a key position and the battalion reserves were exhausted, there were the traditional counter-charges by the men of Jat/Punjab Regiment. The final charge of the Sikhs and Gurkhar of the 1/8th Punjab Regiment. Through a tremendous barrage of trench mortars and machine gun fire. The gallant men went let by their Company Commander Captain John Graham, until he fell mortally wounded. Their cheering rose to a roar, “Bole So Nihal, Sat Sri Akal” as they charged. The situation was completely restored buy only 30 men of this gallant company remained. The Battle of Kampar had proved our trained troops whether they were British or Indian, were superior man for men to the Japanese troops.